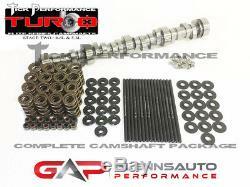 Tick Performance Turbo Stage 2 Cam Kit for 4.8L & 5.3L Chevy LS/LSX. Tick Performance proudly offers their Elite Series of Camshafts designed specifically for 4.8L & 5.3L Engines! Using the latest and greatest technology available, they've put together a complete line of Camshafts that are designed to meet every goal, from mild to wild. Their Elite Series of Camshafts are all manufactured by Cam Motion and are updated with a new version every time an advancement in valvetrain technology becomes available, so they're ALWAYS cutting-edge! Although they suggest measuring for piston-to-valve clearance during ANY camshaft install, every Elite Series Camshaft is designed to fit in a stock engine & stock heads with adequate clearance unless otherwise noted. These cams are designed to maximize power, reliability and valvetrain longevity. Tick Performance Turbo Stage 2 Camshaft for 4.8L & 5.3L Engines. This Tick Performance Elite Series Camshaft Package for 4.8L & 5.3L Engines includes the following. Tick Performance Turbo Stage 2 Camshaft (TPT002TR). 660 Lift Dual Valve Spring Kit w/ Steel Retainers. 7.400" Chromoly One Piece Pushrods, 5/16" diameter, and. 080 wall (set of 16). Designed for: All 4.8L & 5.3L engines, including LR4, LM7, L59, LM4, L33, etc. Expected Horsepower Gains: 60-70RWHP over the stock camshaft in a well-optimized setup the higher the boost, the higher the gains! Rear Gear Upgrade Required: Yes, 3.08 is the minimum suggested. Works Well with Nitrous: No, designed for turbocharged applications. Will Pass Most Smog Emissions: Yes. Turbocharger Size Recommendation: Single 72mm-76mm turbochargers and twin 58mm-62mm turbochargers. Heavier vehicles (4,000LBS+) using single 76mm-80mm turbochargers or twin 62mm-70mm turbochargers should highly consider this camshaft for added low-end torque. 4.8L engines with larger single 76-80mm turbochargers and twin 62mm-70mm turbochargers should highly consider this camshaft due to their smaller displacement and shorter stroke. This is the largest camshaft we recommend for a turbocharged 4.8L. Certain 4.8L racing applications may need more duration, but it is unusual for this size engine. The Tick Performance Turbo Stage 2 Camshaft for 4.8 & 5.3 liter engines is designed for those who want to make more power than possible with the Stage 1 camhaft and are doing so with a larger turbocharger. This camshaft is intended for use with single 72mm-76mm turbochargers and twin 58mm-62mm turbochargers. Those with 4.8 liter engines in lighter vehicles utilizing single 76mm-80mm turbochargers or twin 62mm-70mm turbochargers should highly consider this camshaft due to their smaller displacement and shorter stroke. Those with 5.3 liter engines in heavier applications (4000LBS+) utilizing single 76mm-80mm turbochargers and twin 62mm-70mm turbochargers should highly consider this camshaft for additional low end torque. Idle quality will be slightly rougher than stock with a noticeable lope. Hundreds of hours were spent developing this camshaft to perform precisely the way we advertise, so as a result, changes to the LSA or any other specification of this camshaft are not available. Don't see the size pushrod you need? These are available in anything from 7.000" through 11.550" long in 0.025 increments. 7.400 is the standard LS length, but any of the following can affect pushrod length required and each application may be different. Cam Shaft Base Circle Diameter. We highly recommend that you measure you particular application to determine correct pushrod length due to the number of variables involved. We cannot recommend a length based strictly on combination and the only way to determine required length is to measure appropriately. NOTE: This camshaft utilizes a 3-bolt timing gear pattern. NOTE: The valve spring kit included is designed for stock style valve guides ONLY. The valve spring kit will not work with aftermarket bronze valve guides. Please read the listing entirely as r.
If you have any questions or are unsure of something, please ask before purchasing. Cancellations will not be made for purchasing errors. Are available for your review by clicking the hyperlink. The item "Tick Performance Turbo Stage 2 Cam Kit for 4.8L & 5.3L Chevy LS/LSX" is in sale since Friday, November 30, 2018. This item is in the category "eBay Motors\Parts & Accessories\Car & Truck Parts\Engines & Components\Camshafts, Lifters & Parts". The seller is "glennsautoperformance" and is located in Mount Airy, North Carolina. This item can be shipped to United States, Canada, United Kingdom, Denmark, Romania, Slovakia, Bulgaria, Czech republic, Finland, Hungary, Latvia, Lithuania, Malta, Estonia, Australia, Greece, Portugal, Cyprus, Slovenia, Japan, China, Sweden, South Korea, Indonesia, Taiwan, South africa, Thailand, Belgium, France, Hong Kong, Ireland, Netherlands, Poland, Spain, Italy, Germany, Austria, Bahamas, Israel, Mexico, New Zealand, Singapore, Switzerland, Norway, Saudi arabia, Ukraine, United arab emirates, Qatar, Kuwait, Bahrain, Croatia, Malaysia, Brazil, Chile, Colombia, Costa rica, Panama, Trinidad and tobago, Guatemala, Honduras, Jamaica, Viet nam, Barbados, Brunei darussalam, Bolivia, Ecuador, Egypt, French guiana, Guadeloupe, Iceland, Jordan, Cayman islands, Sri lanka, Luxembourg, Martinique, Maldives, Nicaragua, Oman, Peru, Pakistan, Paraguay, Reunion, Uruguay. California Prop 65 Warning: WARNING: This product can expose you to chemicals, which are known to the State of California to cause cancer, birth defects or, other reproductive harm. For more information, visit www.P65Warnings.ca.gov WARNING: It is illegal to install any aftermarket part that alters or modifies the original design or performance of the motor vehicle pollution control system unless the part is exempted or has an Executive Order issued by the California Air Resources Board (also commonly referred to as the "EO" number). Confirmation: By completing your purchase, you acknowledge that any NON CARB-approved products will be installed for off-road competition use only. Furthermore, by acknowledging you understand the above notice regarding CARB-approved products, and accept responsibility for compliance.